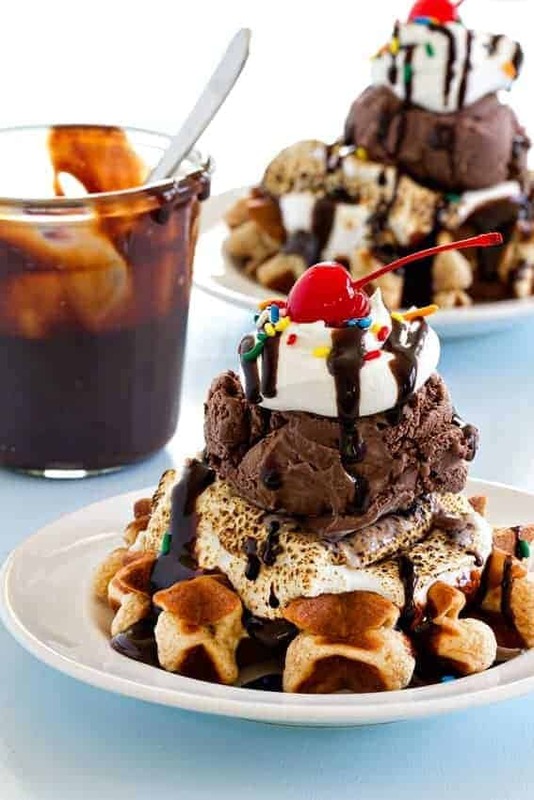 Mini waffles are topped with chocolaty ice cream, toasted marshmallows, and all the fixins to create epic S’mores Waffle Sundaes. Can we talk about Snapchat for a moment? I don’t know if it’s the fact that I’m in my thirties, or that I simply hate change, but I just can’t get on board with this popular social media app. This is more than likely due to the fact that I can’t figure it out because I have zero patience, plus I’m not a big fan of looking at that little ghost. It’s like a cute, innocent Halloween emoji, but this app seems anything but innocent. Plus, it just makes me think of Halloween, and it’s not Halloween on my phone 24/7. That just makes me twitch. Do things really disappear? Not that I care, because I’d probably be snapping photos and videos of cupcakes and my muddy lawn, but the whole disappearing factor weirds me out a bit. It seems so scandalous. I just can’t. I’m sorry for being old, guys. While I was photographing these S’mores Waffle Sundaes, I decided to try to Snapchat a behind the scenes pic and I couldn’t even figure that out, so Instagram it is. When I share behind-the-scenes pics, that’s where you’ll find ’em. 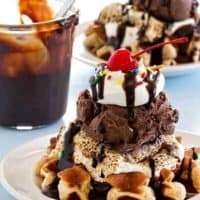 Back to the deliciousness you see on your screen, these S’mores Waffle Sundaes are rich, decadent and completely over the top. I’m pretty certain they’ll quickly become your go-to dessert for summer entertaining. 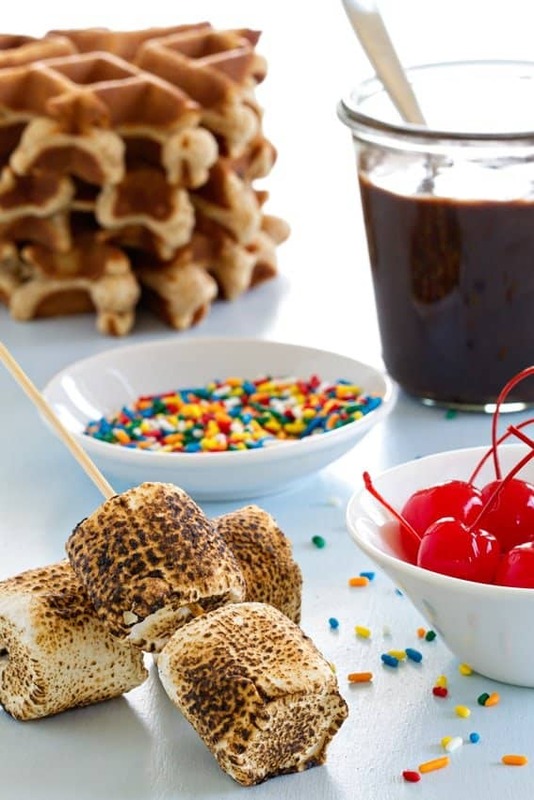 It’s like breakfast collided with dessert and that’s something that I can always get behind – especially when there are ooey, gooey roasted Campfire® Marshmallows involved! You can make the waffles ahead of time and just pop them in the toaster oven or regular oven to warm up while you’re roasting marshmallows. 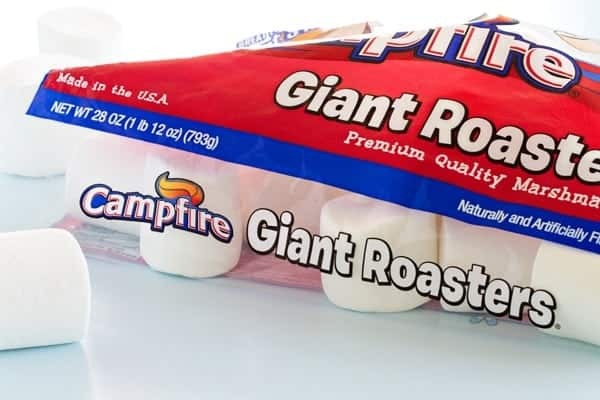 Hand ’em out on paper plates, and let everyone squash their giant roasters on top. Then it’s on to chocolate sauce, any old ice cream you fancy (though I went with double chocolate), whipped cream, sprinkles, and a bright red cherry on top. This is how you do summer s’mores! As you may remember from my No Bake S’mores Cheesecake, I’m partnering with Emily from Jelly Toast and Campfire® Marshmallows. 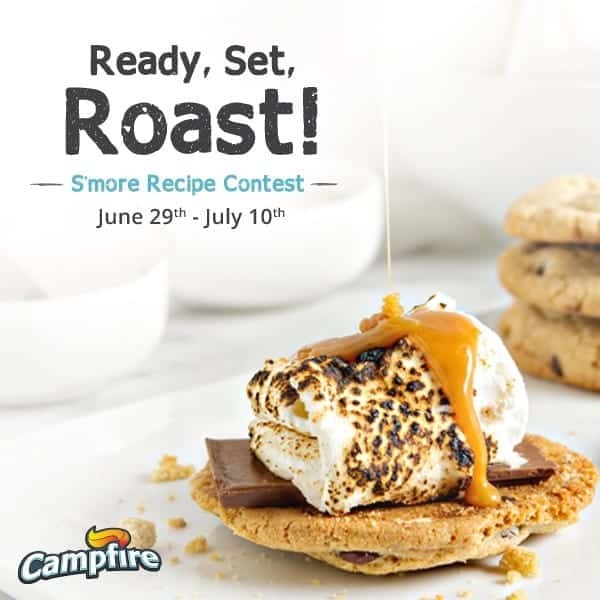 You’ll see more recipes from us, and even more exciting stuff as the year goes on – like this awesome s’mores contest! Preheat waffle iron. I used the number 5 setting on my Belgian waffle maker. In a large bowl with an electric mixer, beat egg for about 1 minute. Add brown sugar, milk, oil and vanilla and mix until thoroughly combined. In a medium bowl, whisk together the flour, graham cracker crumbs, baking powder and salt. Gradually add the dry ingredients to the wet ingredients and mix until combined and smooth. Do not overmix. Spray waffle iron with nonstick cooking spray and pour 1/4 cup of batter into the center of your waffle iron. Close the waffle iron and cook until golden brown; about 2-3 minutes. Repeat process with remaining batter. 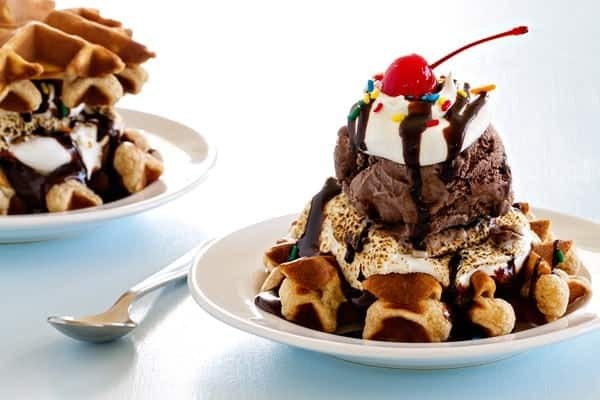 ﻿Scoop ice cream directly onto the mini waffles, top with hot fudge, a toasted Campfire® Giant Roaster, whipped cream, sprinkles and cherries. Serve immediately. This waffle recipe will make 3 large Belgian-style waffles. Leftover waffles can be frozen using this method. Definitely over-the-top, but in the best kind of way! Thanks for stopping by, Medha! They are soooo good, June! Thanks for visiting! Those ooey gooey marshmallows are calling my name! Love this! I’m fairly certain that there is nothing better than a gooey marshmallow!Thanks for stopping by, Katrina! Thanks so much, Stephanie! It’s most definitely over-the-top! Have a great weekend and thanks so much for stopping by! Thanks so much for stopping by, Tasbih! I couldn’t agree with you more! So happy to hear you are enjoying the new design! You’ll love this recipe, Terry! Over-the-top in the best kind of way! Enjoy!